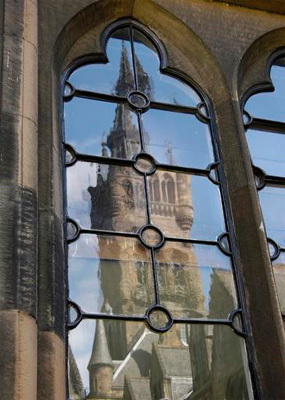 William Turnbull (c1400-1454), Bishop of Glasgow from 1448 until his death, has been described as the "patron and virtual founder" of the University and served as its first Chancellor. Turnbull was an ally and councillor to the young King James II, and had served as Keeper of the Privy Seal c1440-1448. Glasgow was then a Burgh of Barony held of the Bishop, who received valuable income from its inhabitants and merchants in the form of rents and other dues. Turnbull was able to obtain from the King a number of trading rights and exemptions from Royal taxation for Glasgow, and in 1450 the monarch made it a Burgh of Regality, with additional rights and exemptions. The effect of these grants and favours was to increase Glasgow's wealth, and strengthen the power of the Bishop. Prompted by Turnbull, James II wrote to Pope Nicholas V to request the establishment of a university in Glasgow. The Pope responded with a Papal Bull, a letter or proclamation named for the leaden seal (or bull) which was attached to it. Issued on 7 January 1451, the Bull erected a new studium generale for the teaching of "theology, canon and civil law, as well as the arts and any other lawful faculty". He granted the new University's doctors, masters, readers and students all the privileges, honours and immunities enjoyed by their counterparts at the University of Bologna. The Bishop of Glasgow and his successors were to serve as Chancellors of the new University. Turnbull became the University's first Chancellor, and his See had to meet most of the costs of founding and maintaining the new institution. In 1453 he successfully requested that King James grant the members of the University a charter exempting them from all taxes and duties. In December that year, the Bishop granted its members the right to trade in the city without payment of custom, and authorised the University's Rector to act as a judge in civil and pecuniary cases and in minor disputes between members of the University or between them and local people.